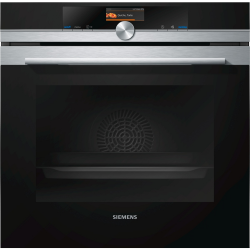 We have already established a number of times, when it comes to the highest top end ovens the Siemens iQ and studioLine ranges are the creme de le creme. The HB656GBS1B stainless steel single oven is amongst the IQ700 line of which we are, alongside the studioLine appliances, an official distributor. Like all good multi function ovens this model features 13 different functions, all of which are designed to make your life absolutely brilliant. Cooking in the current year is virtually effortless with advances like these. If you hate touching knobs and switches then you will be ecstatic to learn of Siemens’ ultra high quality and super sensitive TFT touchDisplay. All functions can be accessed directly from this screen on the front, and when you’re not using the oven a delightful clock is displayed. With softMove technology, the oven door can never slam shut. If you have ever experienced a soft close door on for example a cupboard, fridge frezzer, or a dishwasher, you will already know what to expect. The addition of coolStart means you won’t ever have to preheat the HB656GBS1B as it is intelligent enough to do that itself. All you need to do is input the temperature and cooking time, and the oven works out the rest for you.